Steamed white fish on top of aromatic vegetables is one of our go-to weeknight meals. Simple, elegant, light, nutritious and fast: what could be better than that? Some people are intimidated by cooking fish. Frankly, I’m more timid about roasting meat, given how seldom we do that. Cooking fish in general requires a light touch to avoid drying it out. Sometimes, I bake it in the oven at 300 degrees, on top of sautéed spinach or topped with sautéed mushrooms and scallions. Lately, I’ve taken to cooking vegetables such as finely diced fennel and carrots with a few canned tomatoes and/or the juice in a wide, deep pan. (My home-canned tomatoes are softer and more watery than store-bought, which suits this dish just fine.) You could also add a splash of white wine. Once the vegetables have softened, I lower the heat, place fish filets on top of the vegetables, cover the pan, and let the fish steam until cooked through, just few minutes. I finish the fish by sprinkling it with a few pinches of fennel salt, a concoction that I made over the holidays from sea salt, fennel pollen, and ground dried orange peel. You could also add fennel fronds or other compatible herbs. To make a somewhat fancier and more complete meal, add cooked chickpeas and garnish with black olives and oranges or kumquats. Slice the fennel bulb in half vertically. Remove the core and stalks, and cut the bulb into ½-inch dice. Peel the carrots and cut them into ¼-inch dice. Over medium heat, warm the olive oil in a large broad and deep braising pan (or large sauté pan with a lid), and add the fennel and carrots. Cook, tossing, for a few minutes until the vegetables start to soften. Add the tomatoes and stir to combine, cooking until the vegetables are al dente but cooked through. Add more liquid if needed. Place the fish on top of the vegetables, lower the heat to medium low, cover the pan, and cook until the fish is white and just cooked all the way through just a few minutes depending on the thickness of the fish. Sprinkle with fennel salt and remove the fish promptly to a platter so that it doesn’t overcook. Serve on top of the vegetables. Serves 2-3. 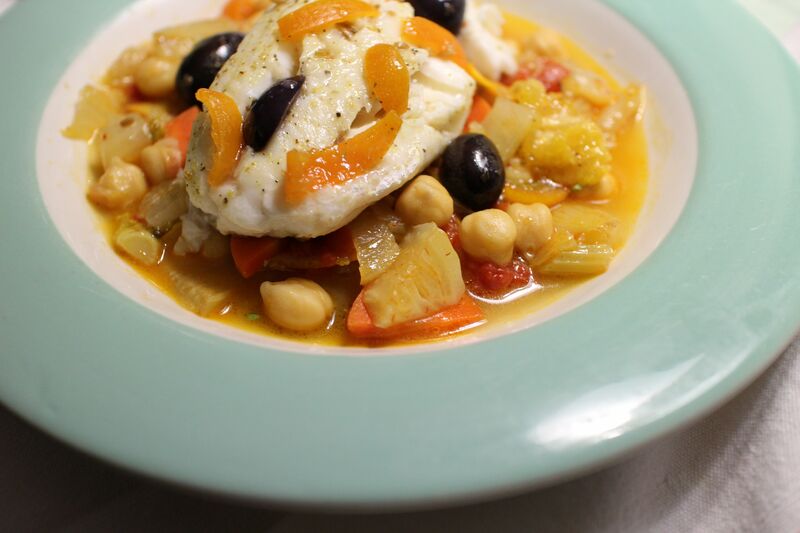 Variation: Steamed Fish with Fennel, Carrots, Tomatoes, Chickpeas and Olives. See recipe above. Add cooked chickpeas to the vegetables after you remove the cooked fish and warm them. Garnish with black olives (oil-cured Niçoise olives are nice)and pickled kumquats or tiny pieces of orange, peel included.